Making sausage with ground chicken presents a challenge because the chicken meat dries out very quickly when cooked and chicken isn't well known for an abundance of fat. In order to create a more juicy sausage, most commercial sausage manufacturers will supplement the ground chicken meat with either pork or beef fat, which, if you are choosing a poultry sausage for dietary or religious reasons completely defeats the object. 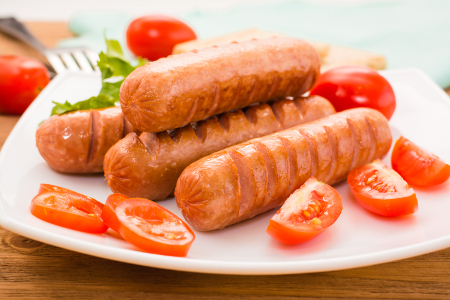 Moreover commercially manufactured sausage uses meat commonly referred to as "mechanically recovered" which means that a machine has been used to strip meat from the bones. Unlike you or I, this machine will not be able to tell the difference between good meat, poor quality skin or even the pin feathers... need I say more? In both the recipes below I don't supplement the chicken with fat from any other animal, in fact I've found that the best ratio of chicken meat to fat can be achieved through grinding boneless chicken thighs together with the fat and skin that comes normally attached. Because chicken meat is gives a soft texture I recommend using a sheep casing. Generally a sheep casing is of smaller diameter but the wall of the casing is thinner making it less chewy on the palate. I don't normally add egg to a sausage recipe (or burger recipe for that matter) because it firms the ground meat but in the case of this pure chicken sausage recipe the addition of an egg delivers the right texture. This recipe uses 1 Kg (2.2lbs) of chicken thigh and you'll need approximately 5m (16ft) of 24mm - 26mm sheep casing rinsed and soaked in warm water. Read my article about making homemade sausage to learn about the full process for preparing casings. Note: This recipe is an emulsified sausage so strict temperature control is required and you will need a food processor in order to mix the meat and seasonings. Refrigerate your grinder and sausage stuffer to ensure that all your equipment is well chilled. Grind the chicken thigh, skin and fat using a 5mm plate and refrigerate for about half an hour. Mix up all the seasonings with the exception of the crushed ice in a plastic or stainless steel mixing bowl until you have a uniform mix that has the consistency of a thin paste. Now mix the ground meat and the seasoning together and knead this mixture until you have an even distribution of the seasoning through the meat. Now place this mix in the freezer until it reaches a semi-solid state. This is the time to get your food processor out. Place the ground meat in the mixing bowl and add the crushed ice and then mix for 30 seconds. Check the temperature using an instant read temperature probe. Stuff the meat into the casing and make your links. Place your links in the refrigerator, cover with a paper towel and leave overnight to let the seasoning fully disperse. If you plan to smoke your chicken wieners then use my guide to cold smoking here. 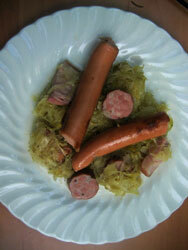 Poach to cook and serve with sauerkraut. The second of my chicken sausage recipes is for that perennial favourite chicken tikka massala. The flavours in this recipe are derived from the classic Indian dish and because it is made with fresh cream I recommend that you eat it fresh (don't freeze) otherwise the sausage can take on a slightly sour note. This Indian chicken sausage recipe makes approximately 1 Kg (2.2lbs) and I recommend a sheep casing 24 - 26mm (1 inch) because this is quite a soft textured sausage. Use this link to learn how to prepare sausage casings. Cream (feel free to substitute soy cream if you have an allergy to dairy). Cut the chicken thigh meat into chunks and grind using a 4.8mm plate and when done return to the refrigerator. Make up your "seasoning slurry" by adding all the seasoning ingredients together in a mixing bowl and giving it a good stir until everything is well mixed. Add the ground chicken to the seasoning slurry and knead well until you have a good distribution of the seasoning throughout your sausage meat. Now transfer your sausage meat to the stuffer and fill the casings and make links every 75mm (3 inches). When done, place the the sausage on a tray with a paper towel over the top and pop the tray in the refrigerator overnight to allow plenty of time for the seasonings to fully disperse into the chicken. This chicken sausage recipe is best finished off on the grill. Use this link to read my tips about how to cook the perfect sausage.